Cinnamon-Hazelnut Chocolates - Do You Know The Muffin Man? Notes: My first recipe from a new book on chocolate making. 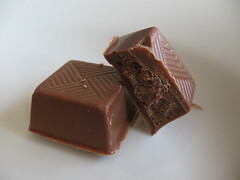 I used a mix of milk chocolate from Lindt (unknown %) and Callebaut (34%). The molding instructions tell you to invert the mold briefly on parchment; I think this is key to getting a thin shell as the excess chocolate drips out rather than pooling at the bottom (top in the finished product). The mold is a cheap one from McCall's and is flimsy, making it difficult to scrape. For the first time, I used a microwave and refrigerator to temper. It's tricky, as the temperature can change quite quickly, but even with some mistakes, the chocolates turned out quite nicely. This is a wonderful chocolate with a strong cinnamon flavour. I would certainly repeat it, as I've got leftover nut paste and nothing else in the book uses it!